Do you have a beautifully landscaped yard however are lacking audio to take your outdoor entertaining to the next level? Unique Companies can help place speakers around your property to develop a site-wide surround sound effect. If you haven’t been in a yard with earth-shaking bass, strategically placed high-end speakers, and discrete mid-range speakers; you don’t know what you are missing. Today’s rugged, all-weather sound systems are easier than ever to incorporate into your landscape, whether it’s a couple of box-type speakers mounted on the outside of the house, or cleverly disguised versions hidden in planters at poolside. Loudspeaker company, Origin Acoustics, has announced its new outdoor living brand, AcoustaScape Landscape Audio. Origin Acoustics understands that designing a perfect landscape system to WOW our customers can be challenging and time-consuming. They have committed top talent from their team to provide Unique Companies and our clients with amazing turn-key landscape system designs, complete with detailed illustrations and instructions for installation as well as a detailed proposal with system pricing. Unique Companies follows a 3 step process to creating the perfect design with Origin Acoustics. Step 1) Submit a completed form with basic information regarding our clients expectations. Step 2) Origins will then quickly prepare a customized speaker layout diagram using our client’s landscape, a product proposal, and Powerpoint Presentation with system specifications and an easy to read installation instructions. Step 3) Unique Companies can then present to our clients the exclusive materials provided by the Origin Design Service team and close the deal on providing them with the ultimate outdoor listening experience, custom-tailored to their needs. The first offering in the series, the AS41 Hi-Fi Landscape Audio System, includes 4 Satellite Speakers and 1 In-Ground Subwoofer… read more. 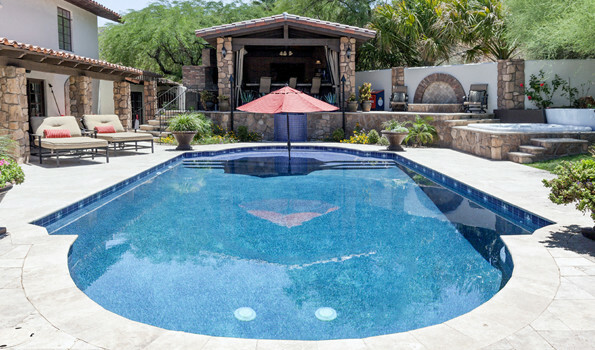 Swimming pools may be a dime a dozen in Arizona backyards, but they are not all created equal. Designed and built by Unique Companies the five pools below are far from ordinary and feature some of the most stunning design elements, including sparkling glass tiles and dazzling fire features. More importantly, each pool is a stunning focal point that compliments—not competes with—the beautiful landscape and architecture surrounding it. 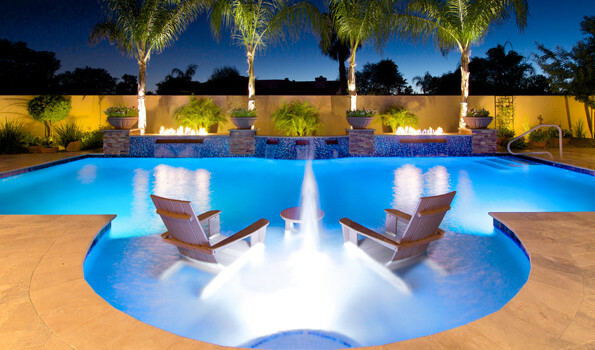 Small in size but big on impact, this geometric pool boasts a beautiful stacked stone wall with waterfalls and fire features that provide a shimmering sight and tranquil sounds. The raised spa, and beautiful LED lighting contribute elegance and excitement while complementing the pool’s clean design aesthetic. This exquisite pool and spa combination is one of our award winning projects for its superb design and engineering. 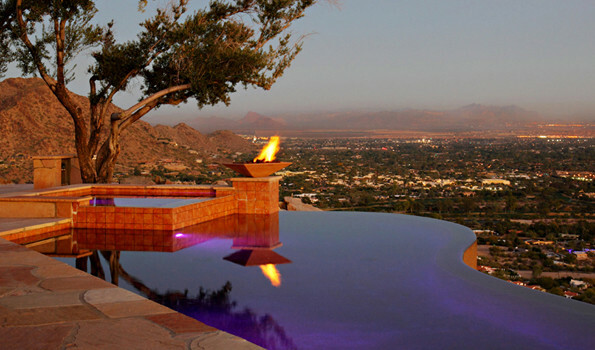 Built on a hill overlooking the city of Paradise Valley, the pool features a negative-edge design, allowing for the best view possible—and the feeling that you’re swimming in the sky. Gorgeous tiles adorn the raised spa and reflect the glittering lights of the city skyline. The timeless design of the classic Roman style swimming pool is as popular today as it was in the days of Ancient Rome. Clean lines and 90 degree angles evoke a Mediterranean look and feel, and straight lines are used to create dramatic focal points. Classic swimming pool designs can be built with Grecian or Roman themes and may include decorative details, such as custom tile work, to accentuate the motif. Sometimes simplicity offers the most beautiful outcome, as this Unique pool demonstrates. 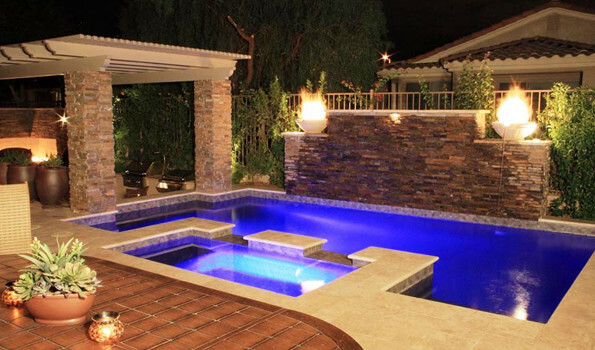 The pool’s classic rectangular shape and attractive, colorful tile wall with water features and fire features and a raised spa make this pool simply spectacular! Use of curves and soft angles recreates shapes found in nature. 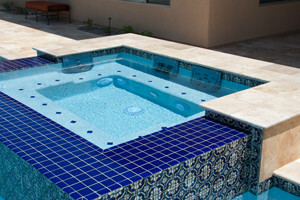 The absence of rigid angles and straight lines creates a swimming pool that complements your surroundings. Natural pools can be built with stone decking, a sloping beach entry, water falls, and other rock features. This unique free form pool features a beautiful natural rock water fall, slide and grotto.